With the evolution of lean manufacturing, suppliers are regularly challenged to find solutions that minimize manufacturing risks and improving yield and throughput - while tracking processes in real-time. Jacobs Vehicle Systems is a USA based manufacturer of diesel and natural gas engine braking systems. 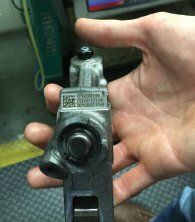 When one of their largest customers requested improved traceability of brake rocker arm components they realised that scannable laser marked traceability needed to be added to the manufacturing process. After evaluating the possible technologies to improve performance, Jacobs opted for the FOBA laser marking system. Working with FOBA - who are TLM Laser product partners - Jacobs moved to a fully automated one stop solution that guaranteed 100% verification. A solution mainly achieved through their Intelligent Mark Positioning (IMP) technology. For the full story, go to www.todaysmotorvehicles.com and see how your company could gain a key competitive advantage.